Vincent Castiglia (born April 8, 1982 in Brooklyn, New York) is an American painter. He is internationally acclaimed for his figurative paintings with metaphysical and often nightmarish subject matters. Castiglia paints exclusively in human blood (iron oxide) on paper. Castiglia is the first American artist to receive a solo exhibition invitation from Oscar Award-winning artist, H.R. Giger, to exhibit at the H.R. Giger Museum, in Gruyeres, Switzerland. 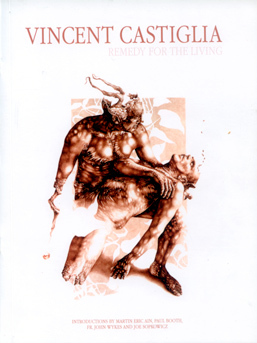 Remedy for the Living, the 1st solo exhibition of paintings by Vincent Castiglia opened at the H.R. Giger Museum Gallery on November 1, 2008, and closed in April 2009. Castiglia’s works on paper have been exhibited internationally and hang in many distinguished collections. In 2009, "Gravity", one of his most celebrated works of 2006, was acquired by rock musician, Gregg Allman. Contemporary art critics have compared Castiglia's work to old masters such as Michelangelo, the contemporary expressionist Francis Bacon, as well as conceptual artist Damien Hirst whose explicit portrayals of death are in similar form.